Kids Read Comics was held at the Downtown Ann Arbor Library on June 22 & 23. Even though both days I tabled were only half days, the con kept me on my toes so much I was exhausted by the end. I participated in both Comics Quickfire and Comics Quickdraw on Saturday and guys, I seriously don’t even remember the last time I drew publicly like that! I ended up with a mess of scribbles on the paper but thankfully, people didn’t seem to mind too much. It was nerve-wracking but the kids seemed to really enjoy it. I was happy to chat and doodle for a little bit with Dave Roman, Raina Telgemeier, John Green and Rafael Rosado. And then, later with Jonathan at the Robot Supply store for Quickdraw. This also has got to be the first time I’ve been at a convention and felt so pampered! Lunch was served on both days and I even had staff volunteers watching my table while I attended the panels. I could get used to this kind of treatment! Thanks so much to Dan Mishkin, Jerzy Drozd and the entire staff at AADL for such a great show. Faith Erin Hicks, ladies and gentlemen! 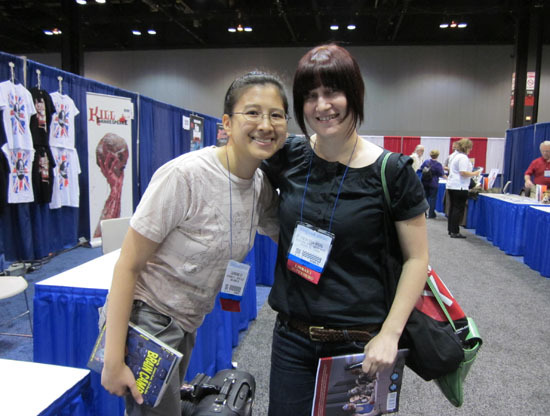 On the completely opposite side of the convention spectrum was the Comic-con for Librarians that was ALA! N and I decided to forgo the expensive hotels and stayed at an apartment from AirBnB in Southside. That meant commuting to McCormick was a bit of a pain but manageable for all 4 days. But oh my god, were they SO WORTH IT. ALA Chicago was seriously the best convention I’ve ever tabled at. Not only was I invited to table at TCAF for the mere price of 2 books and an original piece of art, but BOY, did librarians and the folk they run around with love Polterguys! I sold so much books on Saturday I was running out of $1s and $5s and had to go bug Faith Hicks for change. I’m definitely signing-up for that square app the next time I table because WOW. Another awesome thing about this weekend was getting to hang out with other comic artists after the exhibit closes. On Saturday, I got to eat dinner with Faith, Thien, Darren, Jason, Jerzy and Anne at the Eisner foundation dinner and on Sunday, some of us got to eat out again at Joy Yee in Chinatown. It was really fun listening to everyone talk about the industry, what stuff they were into and just swapping stories. Shoutouts to the awesome people that helped make my Artist Alley experience fun and memorable: Tina Coleman, Kat Khan, Gene Yang, Anthony Del Col, Snow Wildsmith, Scott Robins, Mike Mindy P. (Train buddy! ), Sean O’ Neill and everyone who came up to my table and just talked with me! Thanks so much for all the kind words, encouragement and support! I really hope to see everyone at an ALA again very soon. Hopefully, with Polterguys Vol. 2 books with me this time!